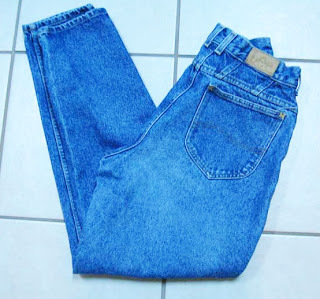 In this example, I am using the front portion of the jeans. If you notice, the front seam does not lie flat near the crotch area. 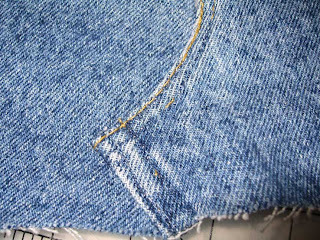 In order to alleviate this issue, open the front seam 1.5”-2”, so that you can “flap” one side over the other, making the front flat. 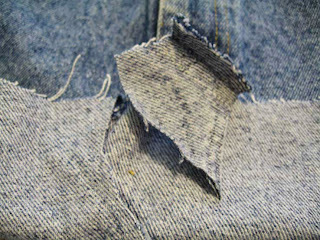 Sew the “flap” in place and trim off the excess denim underneath. 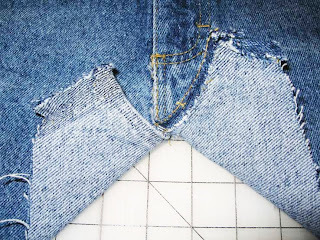 If the bottom of the front is uneven, using care, cut across the front making it as straight as possible. I went ahead and curved both lower corners, my personal preference for this project. 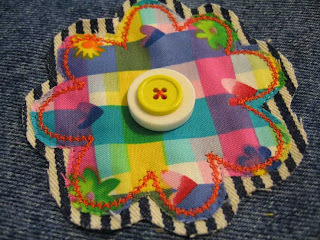 Cover the raw edges with the bias tape. 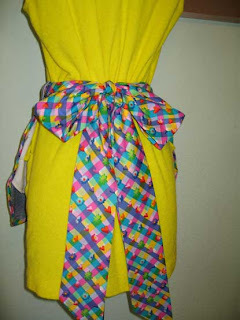 I actually made my own in Part 1 and had enough left over to use for this apron. 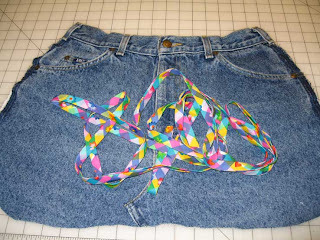 Optional: detach the lower part of the side belt loops, attach the bias tape, and reattach the belt loops. This allows for a more finished appearance. 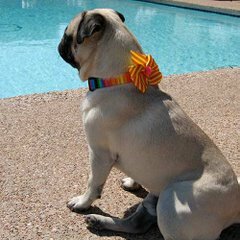 Decide what you would like to use for the tie/waistband and how long you need it to be. I used the same fabric as the bias tape, cutting a piece 9” X 72”. 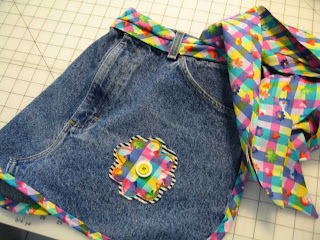 With right sides together fold it in half and sew across one end and along the length of the piece. 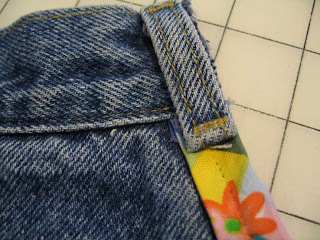 Turn the “tube” inside out and stitch the open end closed. Press and insert it through the belt loops. You just made the tie/waistband! 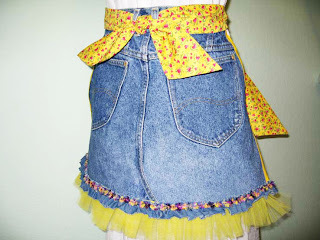 I felt like my new apron needed a “little more” so I cut out a floral shape from a scrap of denim and my printed fabric , attaching them to the apron with a fancy zigzag stitch. My apron is complete—what do you think? Thank you for sharing your design. I have seen thes in craft shows and wanted to make some. 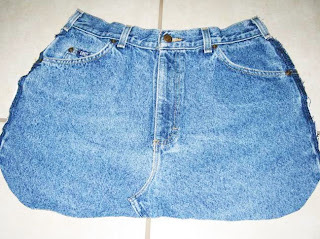 I forgot I had my hubbys old jeans lying around so I need to make a few pairs. 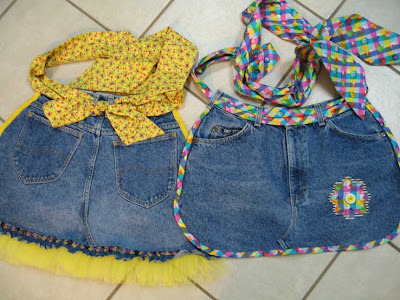 I never would have thought about the kids aprons with the legs! Great idea & I appriciate you taking the time to share with us. These are so cute! 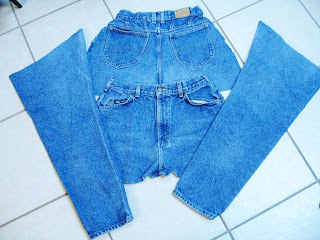 I have jeans and now another idea for what to do with them Thanks! That is so cute! Thanks so much for sharing that tutorial. Those are SO CUTE! 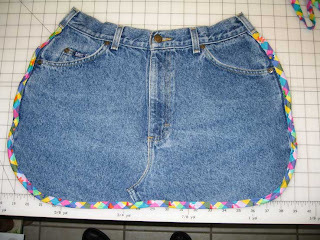 I'm gonna look at Goodwill for some jeans to make some of these! 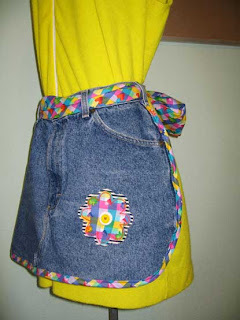 What a great refashion idea!! I am totally featuring this. Holy cow, those are cute. 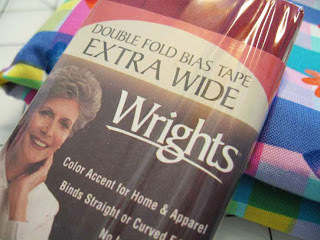 Too bad it's the bias tape and not the pants that should be extra wide. I have got plenty of those. I linked to this again! Brilliant! 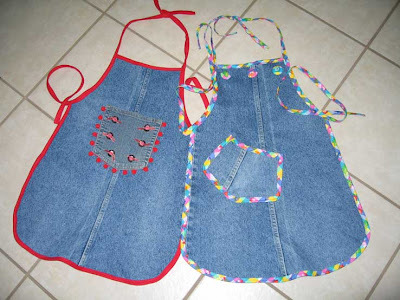 Just made my first aprons from your idea, and posted it on my site.